This was my first Agatha Christie novel. It was like a fun game of Clue. Dr Shepard, a small town doctor in rural England, narrates the details of the murder of a local wealthy businessman. It seems that a number of people would have benefitted from his death: his hard up stepson, his noisy butler, his lonely housekeeper, to name a few. However, the murder might have more to do with the blackmailing of a widow than the financial problems of his household. It's up to retired inspector Hercule Poirot to get to the bottom of the case. In the era of CSI, the ending wasn't really all that surprising (I had my suspicions) but does seem a little sneaky of Christie. I'm still not sure it makes much sense. Anyway, I found Poirot to be an engaging and quirky character. I won't mind reading more of his adventures. There is also a funny scene involving Mah Jongg, that I thought was a great piece of writing. Good, I have both of those on my shelf. I'll be reading those soon. 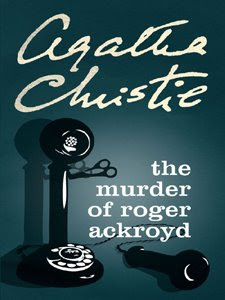 This is one of my favorite Agatha Christie's. Hercule Poirot is awesome!! Now that I think about it, And Then There Were None (or Ten Little Indians, depending on what edition you have) is probably my favorite of all her books! My favorite Agatha Christie's are her Tommy & Tuppence books but I did enjoy them all. The 13th Tale is that good, eh? It's on my TBR shelves. Agatha Christie was one of my favorites when I was a teenager. I've only recently rediscovered her--and it happened to be this book! I enjoyed it quite a bit. Lezlie- TV has ruined me! Stephanie- I'm reading that now. Carrie K- I'll have to add that to the list. 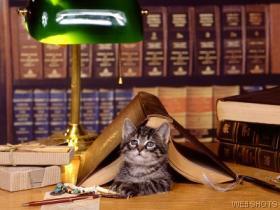 Literary Feline- I'm glad she's brand new to me!